Yes, it is time of the year to "Balik Kampung" when school is having a term break and my company is declaring close of business for whole next week in conjuction of Gawai Festival and Great King's Birthday. I took half day leave today to bake layered cake which is always a popular "Buah Tangan" from Sarawak. I choose the above cake because my Emak does not like colorful cake and I love the moist texture and the sweet & sour taste. 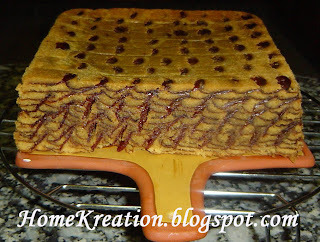 This recipe is originated by Rabiah Amit, the popular layered cake book writer from Sarawak. Her book is a must have if you interested in layered cake making. 3. Grease & line 8 inch square tin. Spread about 2 big scoop into the tin & grill until the top is evenly brown. 4. For all layered cakes, I always bake the cake at 180C for 30 minutes as the last step to ensure that the cake is properly cooked through. For those interested in making layered cake are welcome to ask questions. Just post your questions in the "comments" tab at the bottom of this recipe. 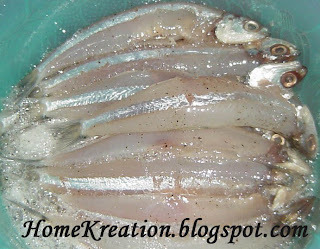 To make deep fried battered fish, it is recommended to use scaleless fish like the ones I used in the picture below (being marinated in egg white): This recipe makes very crispy batter and am sure you will not be disappointed. For busy mum, you can prepare until the last step and freeze them before frying. It is ready to be fried anytime and thawing is not necessary because the fish are not big and has soft flesh which can easily get cooked. Also thick flour coating ensure that the fish will not stick to one another when frozen. 1. Add all ingredients except flour & marinate about 10 minutes. Toast all fish out from egg white & sprinkle enough tapioca flour & ensure fish are fully & thickly coated with tapioca flour. 2. 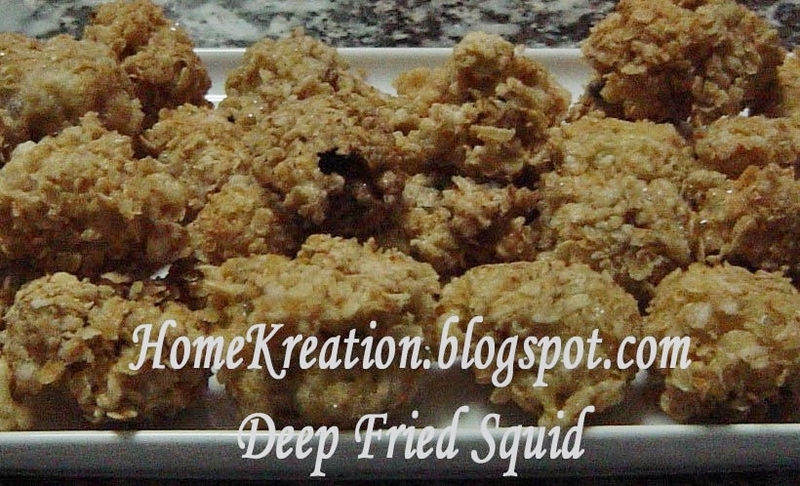 You can either freeze for later consumption or deep fry right away. 3. 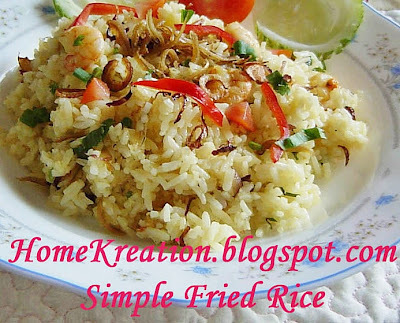 Serve with rice or as snacks. 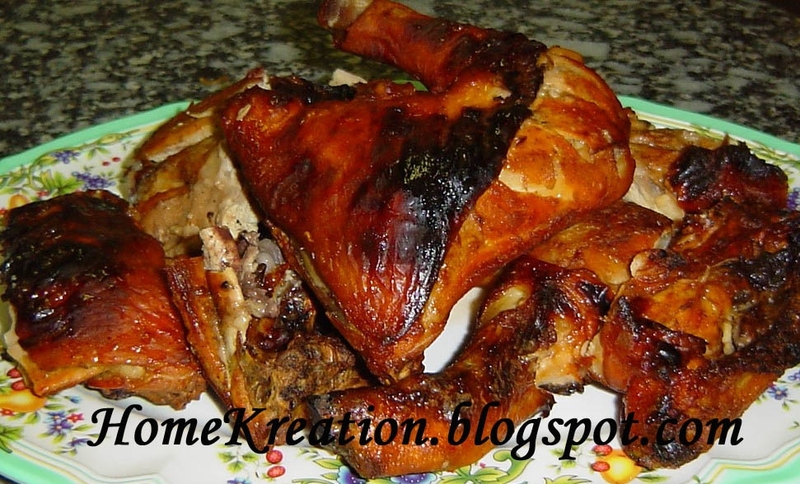 This is very simple to prepare and my family's favourite. I don't normally use any measurement in cooking this but below is roughly as a guide but you cannot go wrong. 1. Coat fish with enough turmeric powder & salt. Deep fry fish until crispy, toast & place in a serving plate. 2. Heat up 2 tbsp Vegetable oil & fry chopped garlic. Add in chilli paste & stir fry until fragrant. Add in all type of sauce, water, cornflour mixture and sugar. Let it boil for a while. It is not necessary to add in any salt & if needed adjust the taste by adding more sauce. 3. Pour sauce onto the fried fish & serve with white rice. The recipe has cream and chocolate in the ingredients making it different than other Moist Chocolate Cake and the result is really yummy! 1. Grease and line a 20 cm round cake tin with greaseproof paper. 2. Melt butter, golden syrup, chocolate and warm water in a microwave oven for 2 minutes, stirring every 30 seconds. 3. Put sifted dry ingredients into a bowl and stir in sugar, Nestle cream, vanilla essence, beaten eggs and oil to mix. Gradually pour in the chocolate mixture. Mix well with a wooden spoon. Fold in the chopped walnuts. 4. Turn batter into prepared cake tin and bake for about 40-50 minutes at 170C or until skewer inserted into the centre of the cake comes out clean. 1. Heat up oil in pot & fry sliced shallots, garlic, curry leaves, mustard seeds & methi seeds. Add in curry paste & stir until fragrant and oil surface out from the paste. 2. Add in coconut milk & tamarind juice. When boiled, add in fish head. Add in salt & MSG. Boil until fish head is well cooked inside. Add in honey, vanilla essence & mix well. Add in flour, baking soda and stir gently. Add in 1-2 tbs milk if it is too thick. 2. Heat a non-stick pan & spread like cooking pancake. See picture above, I used a tiny pan of 5 inch diameter. When bubbles appear & break, turn to cook on the other side. Tips: Do not cook too long or else the pancake will be tough. 3. When all are cooked, sandwich two pieces of pancakes with red bean paste to form Dorayaki. I like to cook my Briyani rice simple & less spicy that allow you to eat as much as you like without leaving the spicy smell in your throat (if you know what I mean.....)! 1. Heat up Margarine in a pot & fry spices, shallots, garlic until brown. Add in ginger, briyani powder, screwpine leaf & rice - stir for a while. Add in water & salt. 2. Transfer pot into an electric rice cooker & when the rice is cook sprinkle yellow coloring. 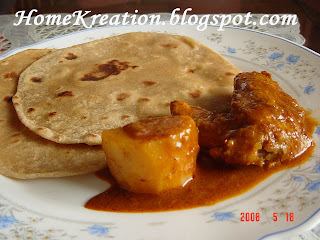 Chapati, Paratha & Roti Canai are regular breakfast menu in my kitchen (occassionally for dinner too). My grandmother was half Indian so this kind of food is a must in our family. You know most old folks do not have specific measurements and recipes when they prepare foods but they manage to produce consistent quality and taste just by instict & skill of what is feel right. 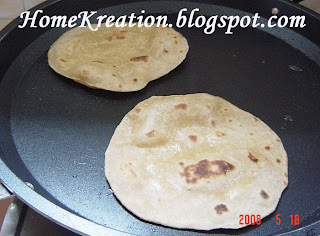 Rotis is one of those which require 'skill' to make and even recipes will not guarantee you can produce soft-lasting texture. It took me many practices before I manage to grasp that kind of 'skill & feel' and once you get it it will never fail anymore. I find it difficult trying to write down the recipes because I simply pour half packet of Atta flour & add in water (mixed with Salt & Sugar to taste) until dough is formed and knead until soft & non-sticky. Divide into small balls & roll out to thin circles. Fry on hot griddle without oil. It will puff up if dough is handle properly. When cook, spread some ghee or margarine on it. I was in a lazy mood this morning after a week of hardworking in the office and a lot of laundry to take care of course. Haah...(sigh) on the other hand, kids always look forward to a special breakfast in the weekend. 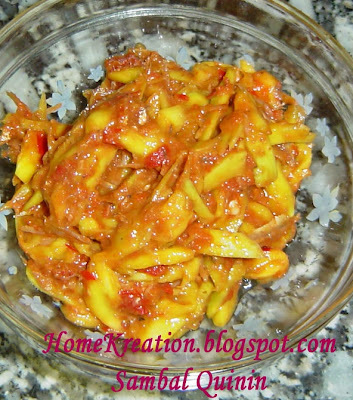 Meehoon Hailam is the best solution as it is simple to prepare and I can just use whatever available in the kitchen without having to run to the market. Most importantly this is my family's favourite & I never fail to get compliments from my boys whenever I served this. 1. Heat up cooking oil & fry garlic until golden. Add in chilli paste & fry until fragrant. Add in chopped tomato & cook until it soften. Add in chopped chicken meat, shrimps, oyster/tomato/chillie/soya sauce, black pepper. Add in water & boil. Add salt only if necessary. Lastly add vegetables & cornflour mixture. 2. Pour gravy onto meehoon when serving & garnish with fried shallots, celery and spring onion. 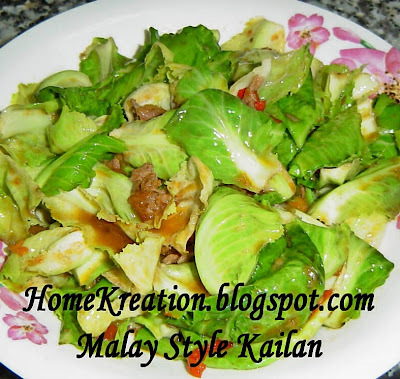 This recipe is contributed by Cik Malati, who posted her recipe to this blog. She calls it "Steam Sarang Semut" translated to "Steam Ant Nest". 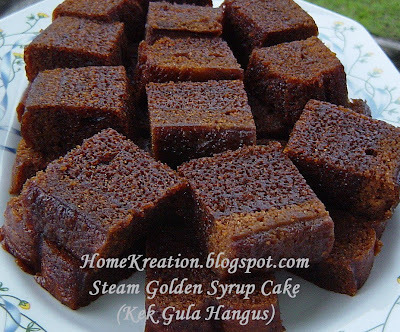 However, holes in my cakes are not as big as expected, so humbly call it "Steam Golden Syrup Cake" instead. 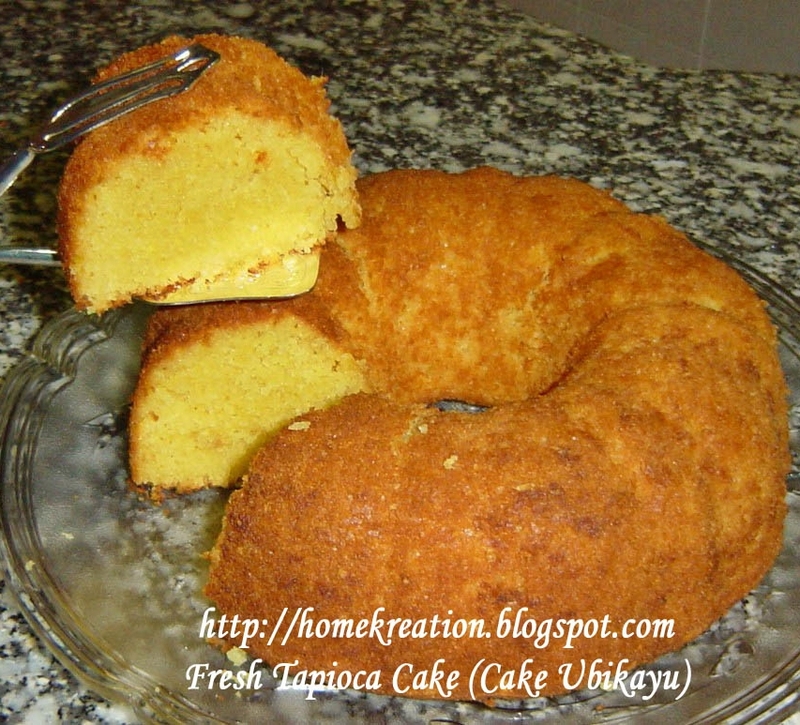 I find the cake is soft, spongy and moist compared to baked version. Thanks Malati for sharing and hope there will be others who come forward to contribute their recipe too. 1. Stir sugar in a saucepan over low heat until melted & golden. Pour in water & stir until sugar is dissolved. (Becareful of hot steam when pouring the water into hot caramel). Boil & add in Butter & switch off fire. 2. Beat egg slightly & mix in condensed milk. Add in flour gradually and lastly bic soda. Add in golden syrup & rose essence. 3. Pour into lined & greased 8 inch round tin and steam for 1 1/2 - 2 hours. Thank-you very much to Auntie Yochana who is so generous in sharing the recipe. I made only half of the recipe below which produced 17 pieces. 1. Cream butter and sugar till creamy, add in vanilla essence & beaten egg and mix thoroughly. 2. Add in plain flour and cocoa powder and mix till just combined. 3. Rest in fridge for 1 hour. 4. Press dough in moulds of your choice. 5. Bake in oven for 15 to 20 mins till cooked. Set aside to cool. 1. For soft caramel, mix all the ingredients together in a pot and cook till thicken. Set aside to cool. 2. Warm up heavy cream for soft ganache , pour in chopped chocolate and stir till chocolate melts. If mixture is too watery, add in extra chocolate. It should be thick. 3. 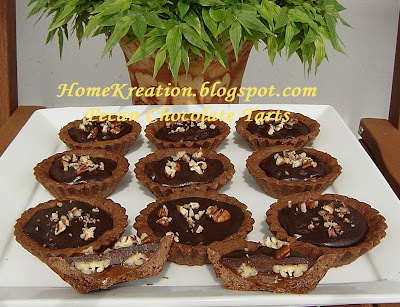 Spoon a tsp of soft caramel into the baked tart, sprinkle some toasted chopped pecans on top and then spoon some ganache on top. 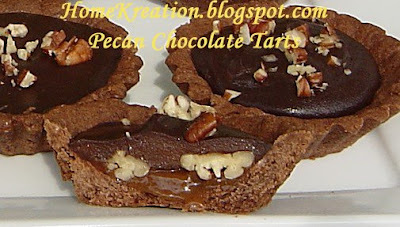 Tap tarts to even the top. 4. Chill in fridge and let it set before serving. 1. 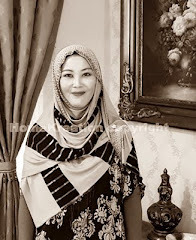 Pukul mentega & gula sehingga kembang. + esen vanilla & telur yg di pukul sedikit. Gaul sebati. + tepung + koko. Gaul sehingga sebati - jgn uli. 2. Masukkan ke ldlm fridge selama 1 jam. 3. Tekankan ke dlm acuan tat. 4. Bakar 15 to 20 min sehingga masak. Sejukkan. Masak semua bhn sehingga pekat. Sejukkan. CARA-CARA:1. Panaskan heavy cream & + coklat sehingga cair. Jika perlu tambahkan lagi coklat supaya pekat. 2. Sudukan 1 sudu teh karamel ke dlm pastri tat, letakkan kcg pecan & kemudian ganache coklat. Ulang sehingga kesemua tat di sikan. 3. Sejukkan sehingga ganache mengeras. HAPPY MOTHER'S DAY to all mothers in the world...! Nasi Goreng (Fried Rice) is a very common food in Malaysia and there are a lot of varieties depending on the ingredients and method of cooking. It can be served anytime and for any occassion. I love playing with different flavours and ingredients. However, this particular one has always been in demand from my family because it suits everyone taste - crispy Ikan Bilis (Malaysian version of anchovies), no egg, no vegetable and most of all not too spicy/hot i.e it just simply tasteful. This is also great when you are in a hurry and it can be prepared & cooked in just 10 minutes! 1. Mix rice with Salt, Pepper & MSG. - Fry sliced shallots, garlic & chilli until golden brown & dish up. 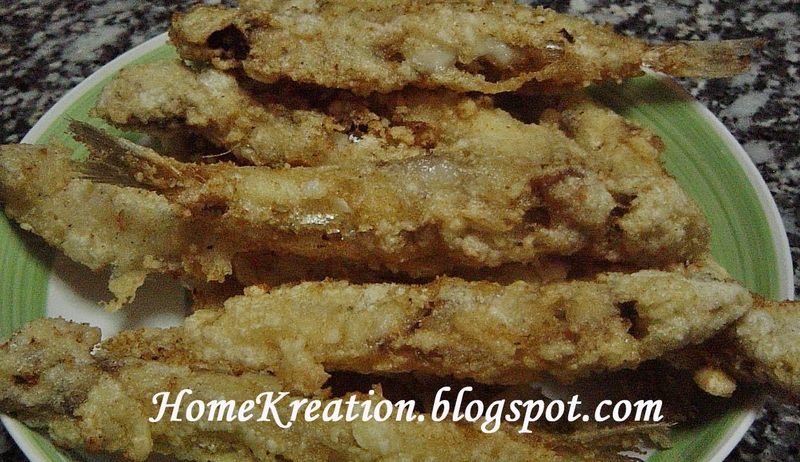 - Fry Ikan Bilis in the remaining oil until crispy & dish up. - Fry shrimps in the remaining oil (add more oil if necessary) for 2 minutes and add in turmeric powder, rice, fried ikan bilis and fried sliced ingredients. 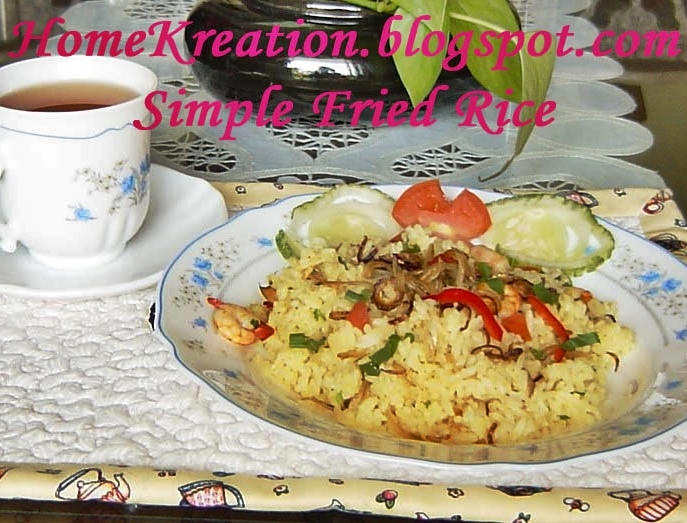 - Mix well and stir 5 minutes until the rice are all heated up. - Put the fire off & add in chopped onion spring & celery. Stir lightly. 3. Dish up and serve with sliced cucumber, tomato &/or salad. Note: Add in scrambled together with other ingredients, if you like and skip turmeric powder as the egg will produce natural yellow color. 1. I'm a mum of 3 teenage boys, look forward to have DIL. Not forgetting my loving hubby! Tonite I decided to cook "Masak Lemak Ikan Goreng" which is my family's favourite. 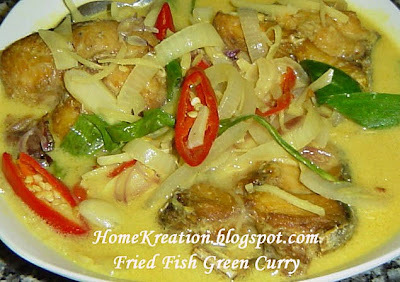 My hubby does not like the conventional Masak Lemak with unfried fish but he loves this very much. 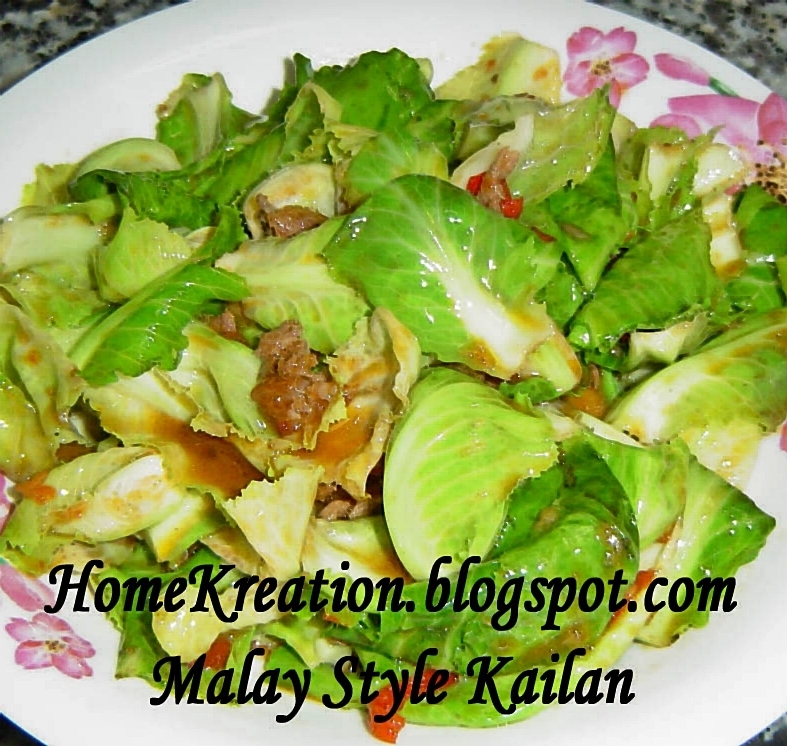 The recipe is my mum's speciality and always impress guests from other state of Perak. 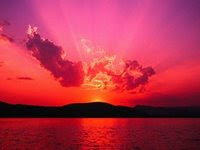 The photo above does not reflect the true color, which is actually light bright green. See the recipe below. 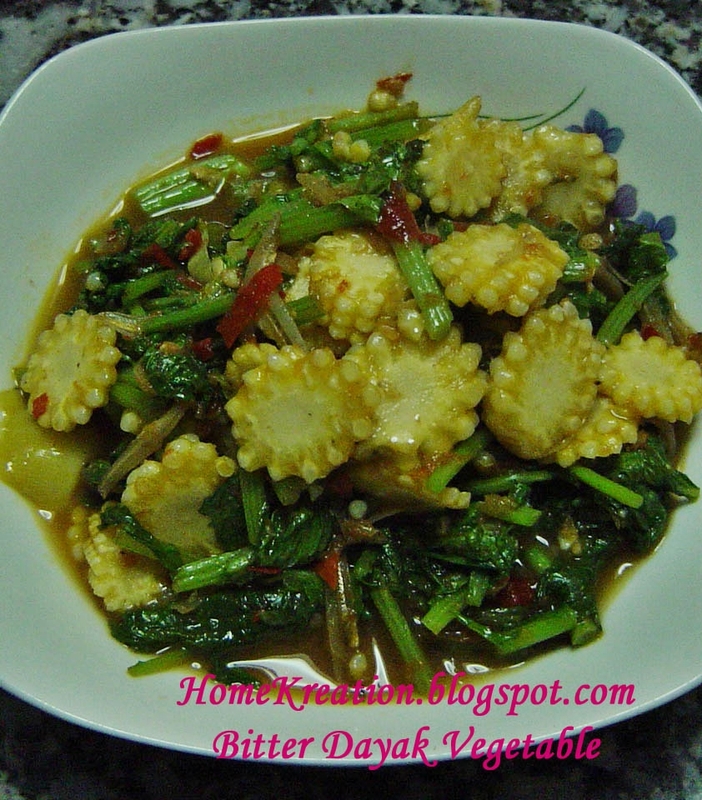 The main dish is accompanied by Malay Style Kailan and Deep Fried Squid, which are all my family's favourite. 1. Coat fish with salt & turmeric powder. 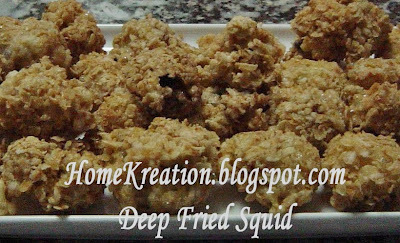 Deep fried with sufficient amount of oil until cooked. Put aside. 2. Heat 2 tbsp of oil & fry all the sliced ingredients and lemongrass until tender. Pour in coconut milk, 1 tsp turmeric powder, turmeric leaf and tamarind. Let it boil & add in fish, salt & msg. Continue cooking for 5 more minutes to ensure the flavour is absorbed by the fish. 3. 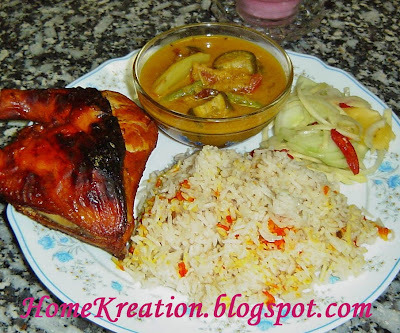 Dish out & serve with hot rice. 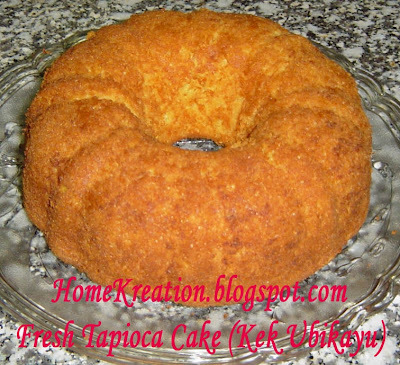 This is a spongy & soft type of tapioca cake unlike the typical Malay bingka - quite a surprise to many, how tapioca can be turned to soft cake version. I've got this recipe from Mesra.net and have also shared the recipe in MR which have been tested with successful result by others. Add in flour gradually mix well. I like to cook my curry simple, the way my mum does hers. Simple means keep the ingredients to minimum so that the taste of beef is not so affected by additional herbs & spices. Some other recipes call for galangal, lemongrass, kafir lime, etc which I skip because I don't like the 'complicated' taste. I received compliments from guests everytime I served this & some asking for the recipe so the reason for publishing this today. Tonite dinner was accompanied with Dayak Bitter Vegetables mixed with young corn and fried with Belacan (shrimp paste). This vegetable is only available in Sarawak and not in the Peninsular (I'll snap a photo of fresh vegetable next time - forgot to do so just now). Most appetising Sambal Quinin (kind of mango fruit but with a distict fragrant) ensured that the dinner tonite is the most enjoyable in the week. 1. Boil bone with sufficient amount of water until tender. I used pressure pot to speed up the process. The stock will be more tasty when pressurised because you need very little water compared to conventional way of boiling. 2. Mix curry powder with enough water to form a thick paste. Add in pounded ingredients* & mix well. 3. Heat up oil in a big pot & fry spices marked** & curry paste until fragrant. Add in a bit more water if necessary. Add in boiled bone, diced potato, coconut milk, tomato & salt. Boil until potato is tender. 4. 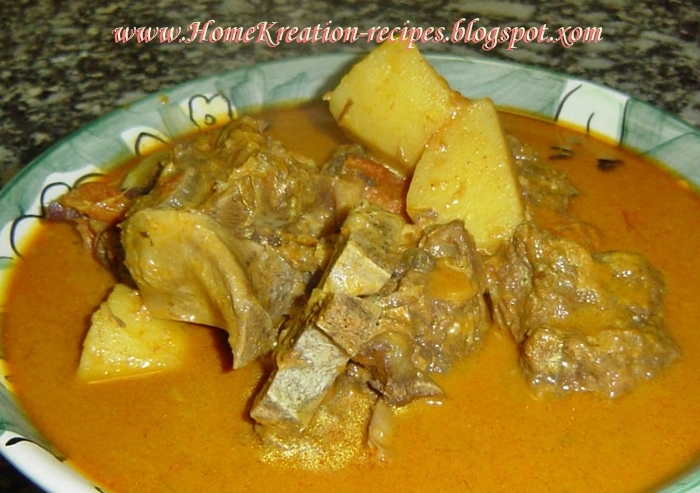 Ready to serve with rice or roti....enjoy! 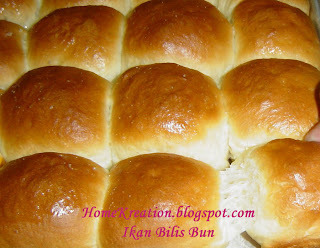 This lovely bun recipe from Yochana produces 2 dozen medium size buns. 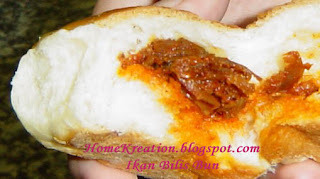 I have changed the method using bread maker and used my own recipe for the Ikan Bilis filling. 1. Put everything into breadmaker (BM) except Shortening. Once the ingredients are well mixed, add in Shortening. Process the dough as per BM instruction. 2. Split the dough into 20-24 pieces. Fill ikan bilis sambal & arrange on greased & floured baking tray. 3. Bake at 180oC for 15-20 minutes.Brush with butter while it is still hot. 3. Add in Ikan bilis, salt, sugar & ajinomoto and stir until a bit dry. 4. Finally add in chopped large onion & cook for 1 minute. 5. Dish out & cool. Use as filling above. Yesterday I sawKak Pah made Sambal Tempoyak and it reminded me that I have some fermented Durian in my fridge given by my mum quite a while ago. 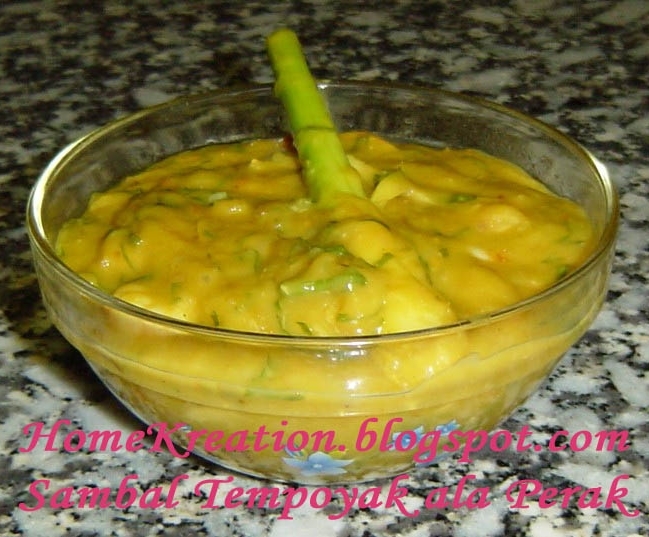 So, before the mood goes away I quickly cooked Sambal Tempoyak with my mum's original recipe. 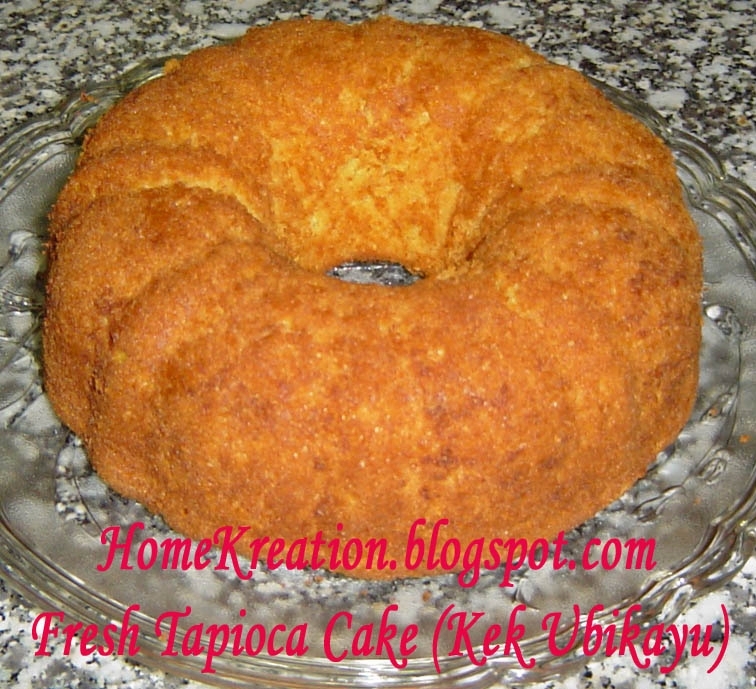 Big thumb up from hubby and sharing with all of you the recipe herewith. 1. Pound chillies, shallots & garlic. 2. Place all ingredients in a saucepan & boil until thicken. 3. Serve with hot rice, cubed cucumber & deep fried fish.